John Kerry fought back Thursday against campaign allegations that he exaggerated his combat record in Vietnam, accusing U.S. President Bush of using a Republican front group "to do his dirty work" and challenging Bush to debate their wartime service records. "Well, if he wants to have a debate about our service in Vietnam, here is my answer: Bring it on," said the Democratic presidential candidate, reviving an old war and campaign slogan amid strong urging from party leaders for him to respond to two-week-old GOP assertions. As Kerry denounced the criticism as "lies about my record," aides privately acknowledged that they and their boss had been slow to recognize the damage being done to his political standing. Kerry won three Purple Hearts, a Bronze Star and Silver Star for Vietnam War combat. Bush served stateside in the Texas Air National Guard. Both men say the other served honorably, but their supporters are pouring tens of thousands of dollars into television ads and other tactics to insist otherwise. MoveOn.org, a liberal group funded by Kerry supporters, is airing an ad accusing Bush of using family connections to avoid the Vietnam War. It also asks the president to denounce an ad that aired early this month by "Swift Boat Veterans for Truth," a GOP-leaning group of Vietnam veterans who say Kerry exaggerated his actions to win Vietnam War medals. Bush campaign spokesman Steve Schmidt said the charge that Bush was in league with the group criticizing Kerry's war record "is absolutely and completely false. The Bush campaign has never and will never question John Kerry's service in Vietnam." Yet the White House refused to condemn the ad questioning Kerry's war record. "Let's not be selective here," White House spokesman Scott McClellan said in Crawford, Texas, where Bush is spending the next week. McClellan said Bush has been on the receiving end of more than $62 million in negative, false attacks by independent groups and "the president has condemned all of the ads," both those that criticize him and those that go after Kerry. In a campaign shadowed by the war on terrorism and in Iraq, Kerry's valorous combat experience is a cornerstone of his campaign. After using the Democratic National Convention to improve his poll ratings on national security, Kerry remained silent as the criticism led to growing indications ― much of it anecdotal, some in polling, party officials say ― that his gains were eroding. His medals are supported by Navy documents and the memories of all but one of the swift boat crewmates who served beneath Kerry, then a Navy lieutenant. The anti-Kerry group, funded by Republican donors, includes several veterans who say they witnessed Kerry's actions from nearby swift boats. One of his most vocal critics, Larry Thurlow, has disputed Kerry's Bronze Star-winning assertion that he came under fire during a mission in Viet Cong-controlled territory. But Thurlow's own military records contained several references to small arms fire that day, according to The Washington Post. Thurlow said in a statement Thursday that his records were based on Kerry's account. Knowing several news organizations, including the Post, were investigating the claims of anti-Kerry veterans, the Democratic campaign swung into action late Wednesday ― rewriting the candidate's speech to a firefighters' union overnight, flying two of his swift boat colleagues to Boston and producing a new campaign commercial, despite earlier plans to stay off the air until September. The 30-second ad features a former Green Beret saying Kerry saved his life under fire. "He risked his life to save mine," Jim Rassmann says. Kerry advisers said they had heard from several Democratic politicians that voters were starting to ask questions about the candidate's war record. The politicians urged him to fight back. Internally, there was an initial reluctance from senior advisers for Kerry to respond ― because they believed that Bush would condemn the critical ad, or that the allegations would blow over. As for the candidate himself, this was personal, aides said. He had heard the group was raising money for more ads, and was tired of his integrity being assaulted. "Thirty years ago, official Navy reports documented my service in Vietnam and awarded me the Silver Star, the Bronze Star and three Purple Hearts," Kerry said. "Thirty years ago, this was the plain truth. It still is. And I still carry the shrapnel in my leg from a wound in Vietnam." Kerry aides said they will maintain the offensive through surrogates, if not Kerry himself. Democrats welcomed the response. "Out of desperation, the Bush campaign has picked the wrong fight with the wrong veteran," said Jim Jordan, former Kerry campaign manager who now runs an outside group airing ads against Bush. "Today's the start of the mother of all backlashes." 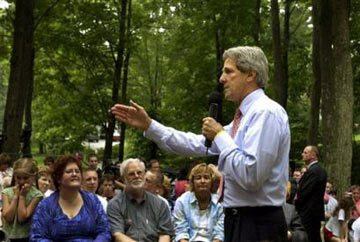 Kerry surrounded himself with friendly veterans and union workers to criticize the group airing the ad against him. "They're a front for the Bush campaign," Kerry said. "And the fact that the president won't denounce what they're up to tells you everything you need to know. He wants them to do his dirty work." There is no irrefutable evidence that the group is a front for Bush or that MoveOn.org is a front for Kerry, though there are at least slender ties between the groups' major donors and both campaigns.